Randall Hall, right, performed a Saturday evening concert at Wilmington College where he played his alto saxophone, while also including electronic sounds and video as part of the experience. Hall has given concerts, lectures, and master-classes around the world. 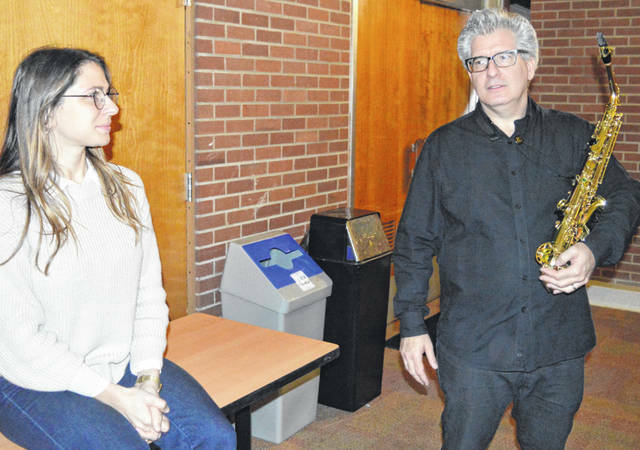 He is pictured here after his WC concert, talking with WC Assistant Professor of Music Brianna Matzke, left, in the McCoy Room at Kelly Center. His program consisted of “Wound” (2018) and the “Chaldean Oracles” (2017).